Octane is officially the first new character to join the cast of Apex Legends. 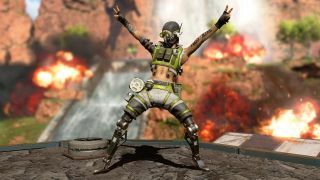 After much speculation, data mining, and mysterious jump pads, Respawn confirmed today that Octane will be added to Apex Legends with the Season 1 Battle Pass, which is live today. Octane is not included in the Battle Pass for free. He costs 12,000 Legend Tokens or 750 Apex Coins. Octavio "Octane" Silva has a stimpak-based kit. His activated ability, Adrenaline Junkie, trades health for speed. The original Octane leak said this amount was 30 percent speed and immunity to slowdown effects (such as Arc Star stun or Caustic's gas) in exchange for 10 percent health, though those numbers may have been tweaked slightly. His passive ability regenerates health over time after not taking damage for a bit, and his Ultimate ability places a jump pad on the ground that can be used for mobility or to gain tactical high ground.